Despite a very short notice, Society of Nepalese Engineers in UK (SONEUK) organised a very successful talk program on 14th Saturday October 2018 at Gorkha Club, London. with a view to tap benefits its members would get and to explore avenues to contribute to engineering services in Nepal, especially in hydropower sector. The talk program was conducted by Shailendra Kajee Shrestha, chairman of the SONEUK, with a warm welcome and an exchange of festive greetings with all the participants. The participants travelled from afar, they had come a long way from East Midland to attend the program. The list of participant is as follows: Arjun Pradhan, Bijaya Bajracharya, Bidur Ghimire , Hitendra Dev Shakya, Sachetan Tuladhar, Mira Bajracharya, Karuna Shakya, Jeevan Karmacharya, Krishna Kishore Shrestha, Shailendra Kajee Shrestha, Rajendra Kharel, Raj Pathak, and Shyam Thapa. Main guest Hitendra Dev Shakya, managing director of NEA Engineering Company, Limited, Nepal, delivered a meaningful and enthusiastic talk on Hydropower, Tunnelling, Dam and Electrical Systems in Nepal. Started with Nepal Electricity Authority in 2045 BS, Mr Shakya has worked at various levels and in various capacities such as director, System Planning Department, NEA, Power Sector Specialist, Office of the Millennium Challenge Nepal, National Planning Commission Secretariat, Expert on Minigrid, Alternative Energy Promotion Centre (AEPC) etc. are a few to name. In the beginning of the talk program, Mr Shakya made it clear that the main objective of his Europe tour including UK was for potential future collaboration with organisations like SONEUK and alike. In his very thought provoking speech, he mentioned that a stage has come in Nepal’s Hydropower development where a paradigm shift or a phase shift has necessitated in independent power producer and private developers more than in Nepal Electricity Authority (NEA) itself, to elevate the confidence in small to large scale hydropower projects and capacity building of Nepalese manpower. He stressed that Nepalese experts with international experience are comparatively more affordable than foreign experts. In this respect SONEUK could play a vital role to motivate its members for sharing and liaising with UK and international expertise which they may have access to. The NEA Engineering Company Limited will provide a platform and it also has a separate provision and can bear out-of-pocket costs of the SONEUK member, if not a full remuneration, for expert consultations. Giving a background of the formation of the NEA Engineering Company, Mr Shakya said it was a lesson learnt from the fate of Nepal Electricity Consulting Service (NEPECON) and National Construction Company Nepal Ltd (NCCN), Nepal government changed the strategy and it formed a different company for a quantum jump and capacity building NEA Engineering Company came into its being in 2017. He explained that it is a Consulting company providing engineering design and Consulting services to Electricity Generation, Transmission and Distribution sectors of Nepal. The Company is registered under Company Act and is owned indirectly by Government of Nepal through its Utilities and generation and transmission entities. Mr Shakya said he welcomes any SONEUK member or anyone recommended by the SONEUK, and will provide a platform to share and disseminate the knowledge and experience. Mr Shakya said that the company is mindful of the challenges of brain drain, so to tackle this, he is in favour of a respectable salary for an exponential growing while keeping in mind the sustainability issues for future. Mr Shakya announced that the NEA Engineering Company could be a platform to give something to the nation from Nepalese diaspora no matter how small the contribution may be, that will be highly regarded as it gives a confidence and boosts a technology transfer. So, to connect Nepalese with international experience it is a great opportunity for any SONEUK members to give a short talk program and share the experience so that the company can access the international expertise. 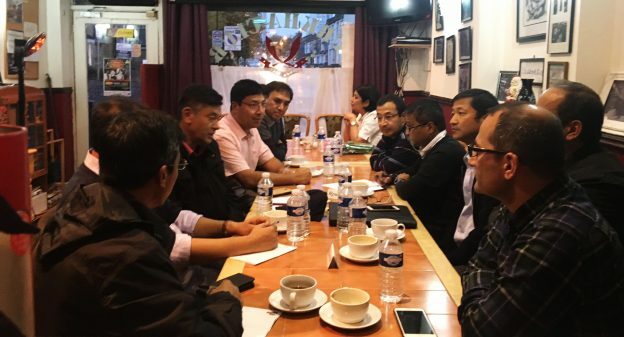 As there have already been some Australian and Canadian engineering entities contributing, Mr Shakya urged SONEUK member for a short presentation or a whole day training when he/she visits Nepal. During the interaction program, SONEUK Chairman Shailendra Kajee Shrestha added that the SONEUK would be a reliable and trustworthy vehicle to liaise with wealth of experts with UK experience for Nepal’s development aspirations. He also emphasised that it would also be a great opportunity for new graduates of Nepalese origin to get connected with Nepal. In response, Mr Hitendra Dev Shakya said, “we need expertise in a variety of fields such as High Volt, GIS, Hydrology, Hydraulic engineers, Dam burst modellers, Rock Mechanics, Dam-seismology, tunnel boring machine (TBM), glacier lake outburst flood (GLOF) etc. for which there is a gap in high level expertise in Nepal at the moment; and SONEUK members can fill this gap”. Similarly, another participant and a Water Resources expert Dr Bidur Ghimire shared the UK practice of Dam Safety Requirements during probable maximum flood (PMF) events. Mr Ghimire assured that Nepal would get benefitted by accessing the UK expert opinion in Nepal’s context through SONEUK. The interaction programme was very well received with an extended Question-Answer session and was full of lively discussions. In the discussion various aspects of Solar power, Electric vehicles were also discussed. Another participant engineer Raj Pathak emphasised that the objective of SONEUK as a charity organisation should be in assisting in independent design verification, design risk assessment, due diligence etc. with minimum cost. In this regard the SONEUK can link available resources. Former Chairman of SONEUK Krishna Kishor Shrestha shared his experience of establishing a company similar to the NEA Engineering Company where he supported Road Department, Nepal with consulting services back in 90s and favoured the relevance of such a consulting company. In addition to the question from the participants at the venue, questions were posed by SONEUK members via Viber and online messaging service regarding TBM, GLOF, Climate Change, Load Shedding etc. Those amongst other to ask questions were Tulsi Phuyal, Boz Raj Pandey, Pravin Ghimire, Keshav Bhattarai and Samir Karmacharya. In response to a question, Mr Shakya clarified that there is still lack of technical capability for large scale projects like Budhi Gandaki and West Seti have been victims of muddled water. Mr Krishna Kishore Shrestha has already conveyed the responses to wider SONEUK members through Viber communication. Mr Shakya pointed out that an energy mix is required to address climatological uncertainties, however in the current scenario, hydropower is a viable solution to Nepal’s Energy demand. He also surfaced that a solar energy would take 80% of its investment outside the country where as a hydropower would take only 45 % of its investment. The programme was concluded by Krishna Kishor Shrestha’s summary remarks and it has paved a way for an MOU between SONEUK and NEA Engineering Company for future engagements.